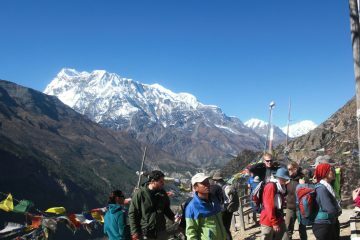 If you are real adventure seekers and want to explore the adventurous trails of Nepal, then what are you waiting for? Grab life by the bars and join our Mountain Biking / Cycling tour. Nature Trail Travels & Tours, Trekking & Expedition has been putting them together for years — not just bike tours, but epic, unique experiences for riders of all abilities. This tour has been specially designed for any cyclist looking to achieve riding goals, build fitness or log big miles in a beautiful place. Here, we focus on nothing but rides, rest and relaxation in some of the best destinations on Nepal like: Dhulikhel, Nagarkot, Kulekhani and Daman. Arrival at Tribhuvan International Airport, Kathmandu. After the clearance of customs and luggage’s, exist from the Airport Departure lounge and as soon as you exist you can see number of peoples outside holding a placard. Among them one of the representative of Nature Trail Travels & Tours, Trekking & Expedition will be holing a placard with your name in it. So, closely look at them. He will then transfer you to your respective hotels. Or else, you can visit our office and after full description about your trip, you will be driven to your hotel. Overnight at hotel. You’ll be assigned to your bike for the week and receive important information about the daily schedule and ride options. We begin our tour from Kathmandu and head towards the beautiful town of Panauti. Panauti is a historical city found in Nepal, as it was originally a small state given by King Bhupatindra Malla as a dowry to his sister. At the end of the 13th Century, Panauti was finally integrated into the unified kingdom of Nepal, along with Kathmandu, Patan, and Bhaktapur, which are all former capital cities of the Kathmandu valley. Panauti, consists of a variety of Buddhist and Hindu religious monuments, and is considered to be one of the most important medieval sites. Panauti is located 32 kilometers South-East of Kathmandu. Our journey begins from Kathmandu to Patan, another historically enriched site. Further cycling, we reach a quiet Newari village of Sisneri. Regardless the fact being near to capital city, this village is still off the beaten path by tourist. For a photographer, this place is a true paradise offering a natural lush green hillside and a natural pool. With the contrast of richly colored villages against a backdrop of snowcapped mountains, we further ride on an ascending trail 500 meters ahead. This is probably the oldest route east out of Kathmandu Valley, connecting the ancient cities of the valley with Panauti. It is wild trail downhill to Panauti. Indreswor Mahadev Temple in Panauti is the oldest surviving temple in Nepal, believed to be constructed in 1294A.D. After breakfast, we set off our ride towards Dhulikhel. Dhulikhel is the administrative center of Kavre palanchowk District, Nepal. The people in the village are Newars, Brahmin, Chhetris, Tamang and Dalit. Dhulikhel has been for centuries an important trading center on the commercial route linking Nepal to Tibet. More than twenty Himalayan peaks including Mt. Annapurna (8091 m), Mt. Ganesh Himal (7429 m), Mt. Lang tang (7234 m), Mt. Phuribichyachu (6637 m), Mt. Gaurishanker (7134 m), Mt. Lhotse (8516 m) and many others can be seen from Dhulikhel. Today, you have two choices; either you cycle of the road and climb up to Dhulikhel, or you can ride in a more adventurous track, which goes more steeply up through terraced fields to the Buddhist pilgrimage temple of Namo Buddha and then descend down to Dhulikhel. This involves a ride of about 35 kilometers. Upon your arrival at Dhulikhel, check-in to the hotel and graze a fantastic sunset view. 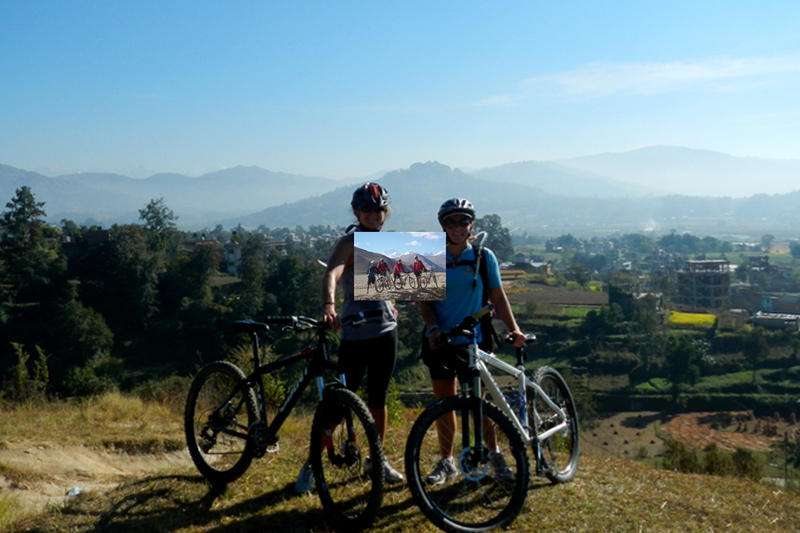 On the following day, after breakfast at hotel you will commence your cycling tour towards Nagarkot. Nagarkot is a hill station located 32 km east of Kathmandu valley. Nagarkot thrills visitors with its unrestricted view of the mountain range from Annapurna in the west to the mighty Everest in the East. Historically, Nagarkot was a place for the royals of Nepal to escape the scorching heat of summer and a hectic city life. In the 60’s explorers would battle the shivering winds and sleepless nights to see the stupendous sunrise and sunsets. Today, still people from all over World, from different walks of life, travel to Nagarkot, to enjoy the picturesque rural scenery of terraced rice fields, green pastures, the sunrise and sunsets. We have to ride through a downhill trail on a little-used tarmac road towards the mediaeval town of Bhaktapur in order to reach Nagarkot. Bhaktapur literally means place of devotees is an ancient Newari city. Bhaktapur has the best preserved palace courtyards and old city center in Nepal, and is listed as a World Heritage Site by UNESCO for its rich culture, temples, and wood, metal and stone artworks. The most famous ancient historical sites like: 55 window Palace, Batsala Temple, Statue of Bhupatindra Malla, Nyatapola Temple, Golden Gate, etc. are located in Bhaktapur Durbar Square. Changu Narayan Temple is situated at the top of the hill surrounded by forest of Champ tree and is also known as Changu or Dolagiri. The temple complex includes one of the oldest Hindu temples in the Kathmandu valley and has intricate statues and stone tablets depicting ancient Hindu folklore. The two-storey roofed temple stands on a high plinth of stone. This shrine is dedicated to Lord Visnu and held in especial reverence by the Hindu people. Unlike other temples of Nepal, this temple is neither in Shikhara Style nor the Pagoda style. It has an architectural style which describe as a traditional Nepali temple. The temple is surrounded by forest of Champ tree which has a myth too. It remains a milestone in Nepali temple architecture with rich embossed works. After a rest day at Nagarkot, we continue our bike ride towards Godawari via Lubhu (Lalitpur), Surya Binayak (Bhaktapur) and Phulchowki. Lubhu is known for its handmade cloth and text tile production. The temple’s religious architectures date back to the Malla periods, according to stone inscriptions. There are altogether five layers of gold-plated masks of the above mentioned deities enshrined in the template. Thus, the name of the place “Lubhu” is derived from “Lunbhu” which means golden plate. En route, we pass by the Surya Binayak temple too. Surya Binayak is a Hindu temple dedicated to the Lord Ganesh. This temple is known as the temple of rising sun. The temple is believed to have been originally built over 1500 years ago in the time of the Lichhavi King Vishnu Dev Barma. Leaving Bhaktapur behind, we head towards north-west on jeep tracks and single tracks, passing paddy fields along the gorgeous and serene forest of Phulchowki on our way to Godawari. 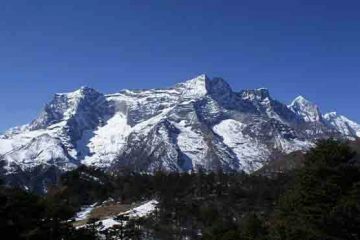 Godawari is one of the popular hiking destinations in Nepal for its rich wildlife and splendid environment. It is also popular for its Botanical Garden which hosts a wide range of exotic and indigenous plants in its famous garden. It has been of prime importance for scientific research and observation, and is popular among both the locals and tourists because of its pleasing landscape surrounded by evergreen natural forest. You can feel a sense of tranquility and refreshment in Godavari. On the following day, we continue our cycling tour on the jeep track into Chapagaon village which offers excellent views of Kathmandu Valley and is also the home of the Vajra Varahi. Leaving Chapagaon behind, we head South Crossing Over Lele River and head up on a short steep climb up on a jeep track and down toward Bungamati. Bungamati is famous village for agriculture, livestock and fishing. It is the hometown of the deity Machhindranath, regarded as the patron of the valley and has large Shikhara-style temple. Machhindranath is regarded as the compassionate god of agricultural prosperity, who is revered by both Hindus and Buddhists. We then approach to the Ganesh Temple (Elephant God Temple) after crossing the suspension bridge over Bagmati River. The sealed Dakshinkali road strings together some fascinating cultural sights and while the ride out is largely uphill, it’s gradual. Dakshinkali temple is dedicated to the goddess Kali. Animal sacrifices, particularly of cockerels and uncast rated male goats, are the main way that the goddess is worshipped, and this is especially seen during the Dashain festival as well as Saturday. After having breakfast at the hotel, we move ahead sampling some exciting trails that lead up and across the valley rim to the south and on to the Kulekhani Dam Site. We ride through the pine forest and pass by many small villages like; Pharping, Hudu, Humane Bhanjyang, Purandi, Fakhel and Kalanki. The slightly longer and rougher road is better for bikers. It heads broadly west and uphill from Pharping, making for the dam on the Kulekhani Reservoir. Kulekhani Dam was completed in 1982 and is the first reservoir Hydropower system of Nepal which is enormous. It is a peaceful place where the beauty of the water reservoir adds up even more beauty to the area. This picturesque lake side is a paradise for a photographer. This route is also known as the ancient trade route from India. Leaving Kulekhani Lake behind, we take the road north along the eastern shore to Markhu (1600m), a small, newly built village (with lodges) at the reservoir’s northern extremity. From Markhu, a rough spur road heads northeast for Thankot, on the Prithvi Highway; a longer but better-graded route heads 13km northwest on a good, pine-shaded road to join the Tribhuvan Raj path 15km north of Daman. We pass through different small villages; Taukhel, Bajra Barahi, Palung, Thana Bazaar and Shikarkot Bazaar. This road is a Prithvi Highway which links Nepal to India. Anyone fancying an introduction to Himalayan hill climbing (14km) can spin all the way up to Simbhanjyang. Daman is famous for its View Tower fitted with long range telescopes from where one can see widest panoramic views of the Himalayas. 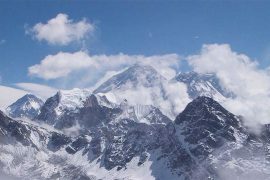 It has a great view of the mountains from Dhaulagiri to Mt Everest. 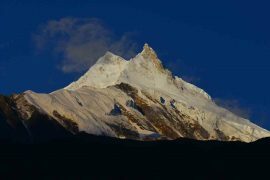 For the view of the Breath taking grandeur of the world’s highest peaks extending in one glittering are from far-east of Sagarmatha (Mt. Everest) there is no better place than Daman. Early in the morning wake up and proceed for a short hike towards Risheshwor Temple. About an hour walk from Daman leads you to this temple. This temple has a faces shaped carved in a stone. People worship this stone as Lord Shiva. Unlike various Shiva Temple, this temple does not have Shiva Linga but a face of the God Shiva. People from various countries and state visit this temple in a belief that their wish comes true. There is a very small pond where people worship and throw the coins on its hole making their wish. According to the locals, during the great festival of “Thulo Ekadashi”, there is a light enlightened automatically during mid-night above the Shiva’s statue. So, on this day there is a huge festival in this place and is crowded with the devotees offering their prayers. On the way to the temple, you can see many prayer flags which makes the environment a peaceful .You can also see a Tibetan Monastery where Lamas. Enroute, there is a sleeping stone where it is believed that whoever sleeps here for a moment won’t have any back pain problems. After breakfast in the hotel, descend down to Palung valley retracing our foot steps back on the same trail. Then we follow a long broken tarmac road to Satghumti and further up to Naubise. From this small town we ride back to Kathmandu and transfer to the hotel. Depending upon you flight schedule, transfer to airport for departure. With the beautiful and a lifelong memory you will take your flight to your hometown. We wish to see you back again in future. Mountain biking is a young sport in Nepal. The trail and excitement involved in the sport is making it popular day by day. Lots of Nepali has taken seriously to make the sport and their dedication is such that Nepal ranked fifth in the Asian mountain bike cross country championship in 1999 in a short span of time. The foothills of the Himalayas are a mountain biker’s paradise. World class rides are accompanied by breathtaking mountain vista’s. You’ll be in touch with centuries-old culture, fresh mountain air, great trails and of course the greatest range of snow-capped peaks in the world. Please note that the mountain biking adventure is a living tour which is affected by multiple factors such as changing weather conditions, group riding abilities, trail damage, and many more. Your local guides are experts in guiding mountain bikers in the Himalayas of Nepal and will be continually assessing these factors and making tweaks to the itinerary where necessary to ensure that every member of the group has the best possible experience. Helmets are compulsory. We recommend polystyrene helmets complying with ANSI Z90/4 or SNELL standards. Cycling shoes, shorts and jerseys are also recommended for your safety and convenience but you can wear what you like and are comfortable with. Many dress up to make it a really fun day. Where can you cycle in Nepal? Much of what you should bring depends upon the type of tour your will choose. A one to three day trip around Kathmandu Valley with an agency will usually have all gear provided. 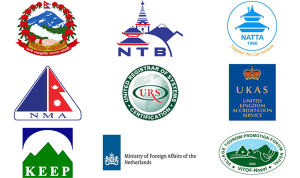 Keep in mind, there are no ‘real’ biking shops or outfitters in Nepal; only agencies for trips. These places may be able to help you with parts and tune-ups, but supplies will be limited. For longer trips, bring the gear you would use in your own country to make your trip a more pleasant experience. 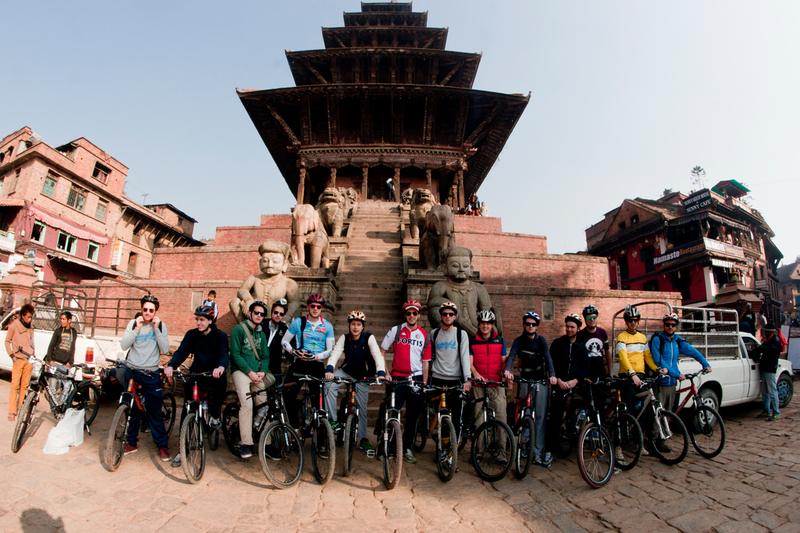 Many bikes are available for rental in Kathmandu and Pokhara. Prices vary according to bike quality and rental time. Bargaining is appreciated. A deposit is usually required but you are not required to give your passport (and this is not recommended). You can simply give scan copies of your passport in order to hire a mountain bike. Can i get my bike through customs? 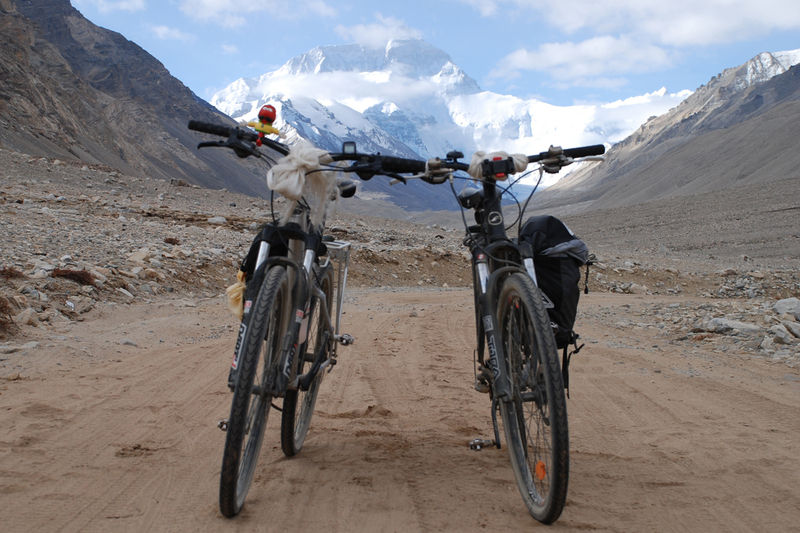 Yes, you can bring your own bicycle to Nepal. Note: shipping any expensive item into any Asian country can be a lesson in patient; like the fellow that received his bike minus the seat! One way to avoid problems with customs officials asking for import duty is to explain that you are a tourist and the bike will leave the country with you. They may give you a receipt to include in your passport to make sure you do not sell your bike in the country, but rarely is this receipt asked for upon departure. Each tour is classified with a grade as explained below. If you are in any doubt about your suitability, be it through inexperience or even over-experience; please let us know for the same. Factors affecting grading include: degree of up/down, difficulty of the surfaces to be ridden, amount of bike handling skill required, distances covered and other factors such as heat, altitude or remoteness. All our trips require basic fitness, preferably acquired through riding your bike, and please remember that any cycling involves some physical exertion, so you cannot expect that you will not feel tired on an ‘easy’ trip. NB Conditions for a particular holiday may vary from one month to the next. The main benefit of grading is to provide an overall indicator to compare one trip against another. Easy– Suitable for anyone who can ride a bike and can manage a bit of exercise. No routes are 100% flat, so expect some climbs and descents. Moderate– Ideal for occasional cyclists and above, or a relaxing trip for better riders. Reasonable fitness required such as cycling, hard walking or similar once or twice a week. Tough– Long cycling days and tougher terrain (for both on- and off-road trips) requiring specific experience of more demanding and technical cycling. Vehicle support may be more limited. You should be very confident of your physical condition and bike handling skills. 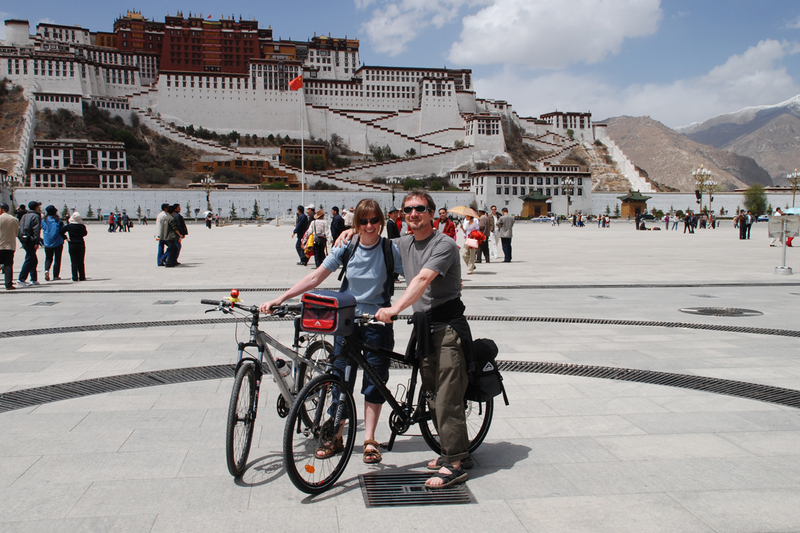 Very Tough– Experienced, fit cyclists and above who are happy to undertake a more expedition-style tour. Off-road experience is essential, including riding on rough, steep surfaces and single-track. Itineraries will include long cycling days in hot conditions with basic facilities; altitude may also contribute to this grade. High level of fitness is required, which can be achieved through regular aerobic training.